The last time I posted, I had been painting at my folks' house. 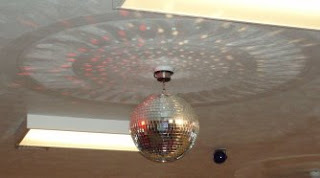 Here's a picture of part of what I painted. 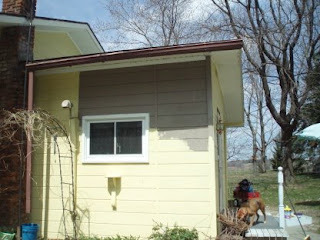 You can see the fawn colored paint that was on the entire house, plus the butter yellow that I painted on all three sides of this part of the house. The lattice and vines are back in place, nary a flower was damaged by ladders, and it was a great job to have done before the end of April! You can see Lynnie on the steps to the right. Always helpful! Tuesday night several of us went to Marcellus, New York, to hear Sue Nickels lecture. She had taught for two days (machine applique and quilting) and her lecture was about machine quilting our quilts. Sue is a wonderful lady and an even more wonderful teacher. She brought several antique quilts from her collection to show, as well as the Baby Beatles quilt and lots of others. The same night, in Paducah, KY, her sister, Pat Holly, won Best Miniature at the AQS show! It was 10 years ago almost to the day that their big Beatles quilt won Best of Show at AQS! Those of us at the lecture had a chance to hear the news first hand and to cheer over the cell phone as Pat let us in on the 2008 winners. If you ever have a chance to hear Sue lecture or to take a class from her, don't pass it up--you'll come away with a wealth of information and have fun learning. I'll leave you tonight with a picture I took a few days ago. 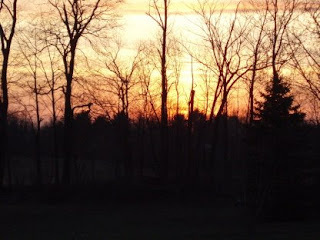 Sunset--one of the best times of the day. Happy Friday! What a perfect April day! I spent a good part of the day helping my mom paint. In the fall most of the outside of the house had been painted a pretty butter yellow. But she has lots of silver lace vines on lattice that is attached to the house and really didn't want to take them down until this spring. So last week my brother removed the lattice and today I helped paint. If the weather holds we should have the painting finished tomorrow and the lattice back up. The vines are already leafing out, ready to reclaim the lattice. To entice you to come back and see what's going on, this is the center of a new hexagon--and the center pink hex is only 1/4 inch per side! The elongated pentagons are about the size of my finger. From the sublime to the ridiculous.... Stay tuned to see what this grows up to be! To wash or not to wash your fabrics--what a hot topic. Here's my take on it. I am a hand quilter and a hand piecer. I also do machine piecing. I am a firm believer in washing my fabric before use. The new fabrics come in the door, into the washer (warm water, cold rinse, regular detergent), into the dryer, and then into the sewing room. Here are my reasons why: First, fabrics can bleed. I'd rather know that before I get a quilt finished, wash it, and have it run. Second, I like the sizing removed to make the hand work easier. No, I do not re-starch it, even before machine piecing. I do use Mary Ellen's Best Press to remove stubborn wrinkles, but have not found it to be a problem with hand work. But the most telling reason to wash is this: I was the lucky recipient of yards and yards of batiks. I assumed they had all been washed, so I started using them right away. Well--I was partially correct--some of the fabrics had been washed and some had not. So every time I pressed my seams (with cotton setting and steam) the unwashed fabric shrank and puckered the seam. I was working on 6 inch blocks with many pieces--not the best time to find this out. Fabrics do shrink at different rates--I like them to shrink what they will in the washer alone, not competing with fabrics that have different thread counts and different shrinkage rates. Also--one last thing--when you buy fabric, it has probably been rotary cut off the bolt, the edges look good, and you start to cut your strips, etc., only to find the dreaded "V for victory--the fabric won"! You know--you carefully cut your strip, open it up, and instead of being nice and straight, it has a V at the fold. You cannot correctly align your fabric before rotary cutting unless you wash it first. Even fabric that is torn is not on grain. So that's my story about washing fabrics before using them. It's how I have made over 450 quilts. 'nuf said! Sweet dreams, and remember to do something special for yourself every day--you're worth it! It's 68 degrees here, the sun is shining, and it makes one hopeful that spring really has arrived. 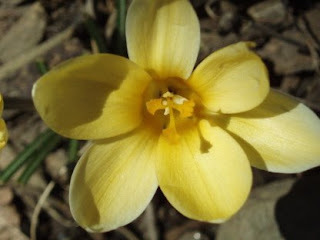 Last fall, unbeknownst to me, my mom planted tulip and crocus bulbs in one of my flower beds. She kept the secret until just a few weeks ago. The crocus picture is this year's! The blossoms are about the size of thimble! I can see the flowers from my quilting room window, so it's a real treat. I've been busy finishing some projects, getting a couple to the binding stage and updating some classes on my website. Everything takes longer than expected. Plus I'm trying to get some raking done and the debris picked up in the yard. 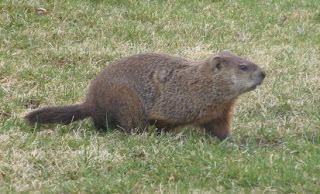 It will soon be time to mow--and a 2 acre lawn is not done in the blink of an eye! Ah, to be Jeannie (as in the I Dream of Jeannie of Jeannie). Think how much more we could accomplish if we could blink and it would happen! I should have quilt pictures to post in the next couple days--stay tuned! 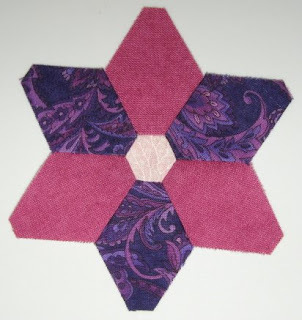 Today was the hand pieced hexagon class at O'Susannah's. Imagine my delight when one student brought in not one, not two, but three finished quilts, all since March 9! 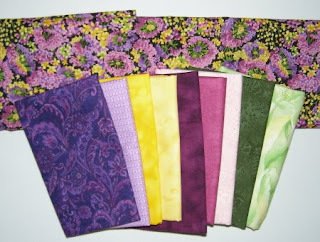 These are the work of Diane C., who is a wonderful lady and prolific quilter! 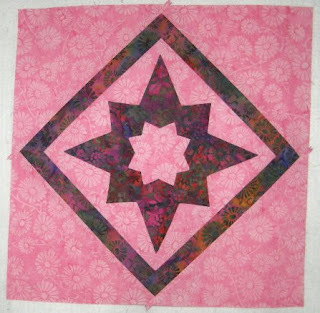 The first piece is from the All Curves Cutwork Class on March 31. Instead of one block, Diane made three and made a runner out of them. 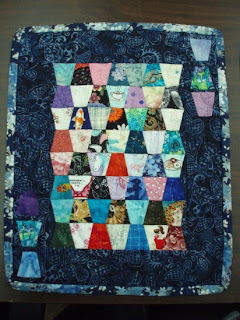 The next two quilts are from the Thimbles class. What a difference the choice of fabrics makes. The tea cup piece is very elegant, while the novelty print one is whimsical and fun. Diane hand quilted all three pieces. Great job, Diane! Here's a tip for you on this Sunday night: When choosing a hand sewing needle, the larger the number, the smaller the needle. For example, a 12 is smaller than an 11, which is smaller than a 10, etc. My preference for needles is this: For hand piecing and applique, I like John James Gold n' Glide Size 11. They are not cheap and you may want to try something a bit less costly if you're not sure you'll like the technique. On the less costly side: John James Sharps 11 (or 10 if you like a bit bigger eye and a bit more length); Richard Hemming Large Eye Sharps size 10 or 11. For hand quilting I like Richard Hemming Large Eye (NOT big eye) betweens size 10. With the technique that I do, there is a lot of torque on the needle and the size 11 and 12 tend to break, especially when quilting through seams. Hands having a hard time holding a small needle? Move to an 8 or 9 between for a bit more length. The good news? Needles are probably the cheapest part of our projects, yet can do the most damage when not used properly. Do you have a burr at the end of the needle that catches in your fabric? Does the eye have a rough spot that keeps breaking thread? Is there a point on the needle? (Don't laugh at this one: I tried to applique with a new needle and kept wondering why the fabric handled like iron--there was no point!) Change your needle at least every 8 hours of sewing. You need more hand strength to work with a dull needle--give your hands a break! Remember every day that you are special and unique. Celebrate you! Thursday was a great day of show-and-tell by my students at O'Susannah's in Watkins Glen. 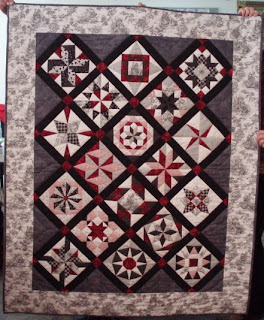 First up is Lori M.'s Monthly Bliss 1 quilt. She worked just in black, white and red--and what a bold, graphic statement she made! 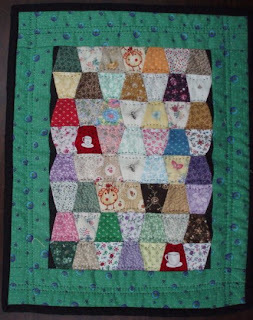 The blocks were hand pieced and she had the piece hand quilted, with the quilting designs extending the blocks into the borders. Just exquisite! Great job, Lori! 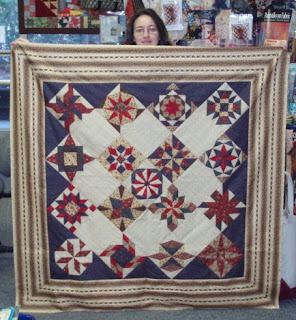 Debbie H. completed (including quilting and binding) this thimble quilt since March 9. 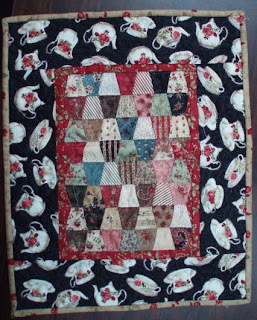 The center is hand pieced, she hand appliqued the thimbles on the side borders, and she hand quilted it! We both love the novelty prints--what could be more fun! Debbie also hand appliqued, hand quilted, and bound this All Curves wallhanging since March 31! She has definitely been threading her needle every day! Way to go, Debbie! Me? 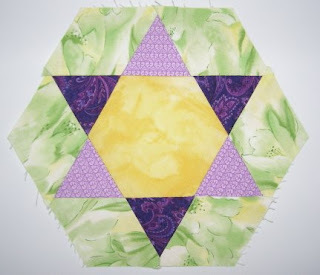 I've been prepping for a hand pieced hexagon class on Sunday. And doing odds and ends of those pesky household chores that never seem to end. One of my friends said that no matter how well you do housework and cooking and dishes--you have to keep doing them again and again...and again. So she eats out! If you are in need of a really good laugh, visit www.yarnharlot.ca/blog/. It's written by Stephanie Pearl-McPhee, a Canadian knitter. I have all of her books and they are an absolute riot! 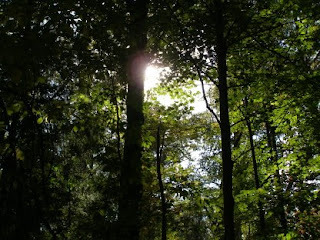 She is presently on a book tour of the US and her blog is cataloging her journey. If you substitute quilting for knitting, she is speaking to all of us quilters too! May the bliss of handwork--in whatever form you enjoy--be with you! Many thanks to those of you who responded to my quandry. I just couldn't leave the blocks together, so I spent part of the day frog stitching (rip it, rip it) and resewing the blocks into tops. Here's what I came up with. I decided to use a batik with a bit more color in it for the borders. Surprisingly, I only had a fat quarter of it, but was able to finish both tops. There was only about an inch left, plus a few scraps! I like the counterpoint between the curved applique and the sharp lines of the squares. The all points block was a bit harder to decide on a set. The block looks better on point, but the darker fabric was too over-powering for the center. So I framed the block with the similar print and then added the pink background again as corners. Having the additional pink opened the block up and makes it more lively. I plan to do lots of quilting in the corners, perhaps in a dark or variegated thread to show more. I'm happy with the results. I know some of you thought the runner was fine--what do you think about the new tops? Other than prepping for two classes on Thursday (Bliss) and one on Sunday (Hand Pieced Hexagons), that's all the sewing I did today--but it was very satisfying. I hope you threaded your needle today! The best laid plans of quilters everywhere--often go astray! Yesterday I decided to set my All Curves and All Points blocks on point and make a small runner. My original plan was to put a final border of the pink daisy fabric around the whole thing, but that didn't look right. I toyed with taking the corner triangles off and making it pointed on the ends. And I am now considering ripping it apart and making two separate small hangings, with a small inner border of the darker fabric and a wider border of daisy fabric around that. But I'm still cogitating on it. (The piece is really rectangular--my design wall has a bit of a wave that impedes flat photography. That's why I'm so much better with any subject but my quilts!) What would you do with these blocks? Keep them together? A different set? Let me know! 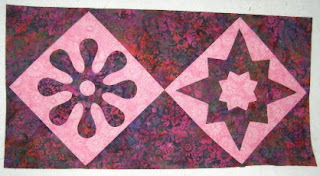 When I got to my hand quilting without a hoop class tonight, Karen Fritz had brought her finished Monthly Bliss 1 top. She took the class a couple years ago and decided to design her own set for it. Now she's "relearning" how to hand quilt--she is used to stabbing her underneath finger and rocking. My method eliminates frames, hoops and sore fingers! I can't wait to see this top quilted! Great job, Karen! 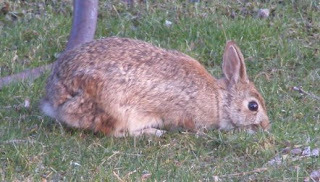 A new bunny picture to leave you with tonight (I guess technically it's early morning). I have crocus and tulips poking their heads above ground and my daffodils are in bud. The peepers are still peeping--but we are supposed to have snow by Monday. Happy Thump Day! Almost 60 degrees, sunny, slight breeze--what a perfect spring day. It's also my mom's 75th birthday (don't tell her I told you!). She's the best mom ever--and even though I may be extremely biased in that opinion, others have said the same thing. Many even want to be adopted by my mom! She's that special and more. Lynnie and I spent most of the day outdoors. My silver lace vines had grown into a jungle and were making the arbor lean--rather precariously. So I took hand clippers and a bigger branch lopper and went to work. I couldn't reach the very top, but I have one side completely bare, and the other side about half. The vines had also reached over onto two sections of picket fence that were at least four feet away from the arbor! When I was sitting in the parlor earlier, after pruning, it was so bright inside that I thought I'd have to put on sun glasses. I guess four years of not pruning silver lace is not a good idea! I heard the peepers for the first time today! I know they need to be frozen off three times, but it was so exciting to hear them! Hopefully I'll have more quilting news for you tomorrow. I haven't touched a needle in two days--busy with other things. But I have several new projects to start and/or finish and then I'll share them. Hope your Sunday was as wonderful as mine has been. Happy quilting! It's a rainy, dreary Friday here in Groton. A good day to sit snuggled in a chair, covered by a quilt, to read the latest quilt magazine or quilt history or quilt mystery...you get the idea! On Wednesday I chose these fabrics for a new project. As I work on it, I will share more photos--it's something I've been thinking about for awhile and finally the fabric selection fell into place. I can always tell something isn't quite right when it takes me more than 10 minutes to select all the fabrics I need. If I am agonizing over it, I need to step away. Prior to these fabrics, I had tried at least twice and had about half the fabrics chosen when the process went awry. A week later, voila! Fiber content of thread has been a hotly-contested discussion topic for quite some time. 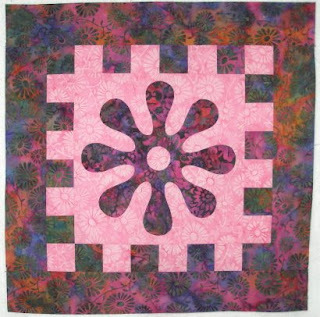 When I first started quilting I used cotton-covered polyester for piecing, applique and quilting. It was readily available and reasonably priced. Then we learned that polyester can actually wear holes in your cotton fabrics over time. I still figured I was okay because my polyester was encased in cotton. Well.... The polyester wears away the cotton covering and then turns toward your fabric! So now I use only 100 percent cotton. 60 wt. for applique; 50 wt. for piecing (both hand and machine), and 40 wt. for hand quilting. 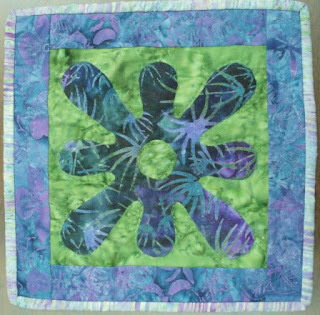 My quilts are softer to the touch and more flexible. Some people say they don't care what kind of thread they use--I say that's a poor attitude! We are making tomorrow's heirlooms. I want my quilts to outlive me! Stay tuned to see what happens to that group of fabrics--I can't wait to get started! Well, by all accounts we made it past Thump Day. Today I have two classes of Monthly Bliss--on the quilt I posted a couple days ago. We are almost at the end of the 10 month journey--it's just amazing to see the fabric selections and and the wonderful colors being used. 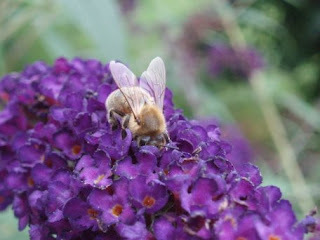 I'll leave you this time with more images of spring. Happy Thursday! Today's post will be short as I have two classes (numbers 2 and 3 of five classes in three days). Sometimes I feel like "if this is Wednesday, it must be _______" (fill in the location). 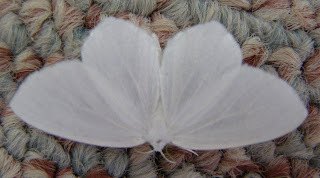 Here's a picture of a white moth/butterfly--winged thing. 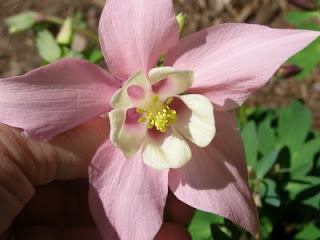 It's delicate beauty is something to behold. Enjoy your Thump Day with gusto!